In a nutshell, the world revolves around the power of communications. Within a casual, business or personal scenario, conversations pilot how relationships are dictated. In the studio or on the stage, musicians deeply feed off connections with their fellow artists, which can determine the overall tone of their musical canvas. Bay Area musician/producer/songwriter Darryl Anders and his band, AgapeSoul, fully subscribe to this theory. Picking up where they left off with their Believe in Love CD, which charted on the UK Soul Top 30 Best in 2012, Conversations marks AgapeSoul’s second CD where funk, soul and jazz always pleasantly collide. However, the overall content of Conversations is purposed to more than just moving and grooving jams. Investing three years in the writing process and dealing with unexpected life interruptions, Anders fully explores the power behind the conversations. 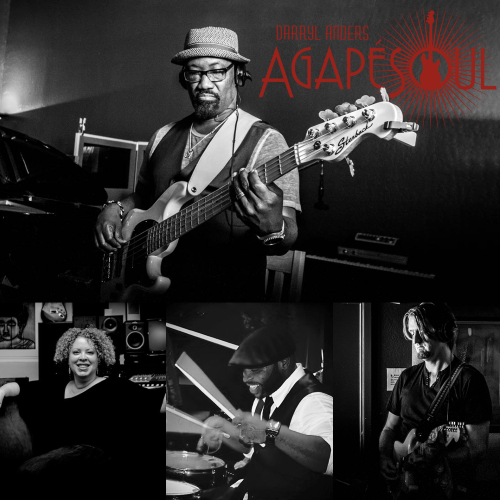 The current AgapeSoul lineup is aided by prolific players such as Paul Jackson, Jr., Eric Gales, Ivan Neville and Tommy Sims. Leading off the Conversations is "Kite," a touching tribute to Anders' wife, introduced by tapping bass guitar lines and Zoe Ellis' confident lead voice. SoulTracks' previous First Listen showcase of "The Way That We Love" brings another passionate rendering by Ellis in celebrating romantic love and another of Anders' tender bass solos. Speaking to the hardships of love, "Changes" brings a dose of sad but necessary reality after all is said and done: "This is a chance they take/These are the hearts that break/When it’s time for change." Michael Maher from Grammy nominated fusion band Snarky Puppy contributes a horn solo. To sum up how verbal communication works for Conversations, the title track is poignantly captured by Sims' opening spoken word reflection: “Imagine what could happen if I sat down and you sat down/And we just rap about it for a minute, y’dig?/Maybe we could start with that.” Vocally, the lead from Naté SoulSanger and backgrounds from Sara Williams are exquisite. Then there is the spiritual uplifting conversation that entails "Think About It," sending a clear message of being vigilant in handling our business: "Draw your own conclusion/Don’t give into that illusion…There is power in the healing.” The song takes huge flight as SoulSanger lifts her powerful voice to the heavens, decorated by a gospel and blues vibe and Lynette Williams' organ adding to the already joyous atmosphere. The disc only slips for a moment on "Home,"not due to Tommy Sims' lead vocals, but because the overwhelming production drowns him out. However, redemption soon follows with a satisfying version of The Ohio Players’ big R&B hit, "Sweet Sticky Thing," between the enticing hook and sassy performances from Ashling Cole (of Graham Central Station) and the brass section. For sheer diversity, "Fruitvale Gumbo" is a pleaser, with AgapeSoul flexing the power of instrumental conversations by blending gumbo stew out of Minneapolis, the Bay Area and New Orleans. This song draws upon Anders’ work with Zigaboo Modeliste, legendary drummer of The Meters, and is anchored by the brass section from Snarky Puppy, with Eric Gales layering a rock/funk solo and Neville's clavinet properly filling the spaces. Anders further pumps up the conversation with rolling bass guitar lines echoing inspiration from his idol, Marcus Miller. Undoubtedly, Anders and AgapeSoul are the real organic deal for crafting deeply soulful conversations. And Conversations fulfills its points by providing notable conversation pieces, and showing that, as impressive as the individual contributors are, Anders and AgapeSoul create a result that is even greater than its musical parts. Solidly Recommended.